Edythe Muriel Attewell of Martensville, Saskatchewan passed away January 8, 2019 at the age of 92 years. Edythe was one of 5 children born to Zora and Robert Ford of Ross Creek, Alberta. She leaves to mourn her passing her 4 children and their families, James Attewell (Judy Miskulin) of Calgary, Ab. ; Esther (Dan) Cramp of Corning, Ca. USA. ; John (Linda-Beth) Attewell of Verona, On. ; and Dorothy (Marvin) Ens of Martensville, Sk. ; Grandchildren, Christine Nillson, Deanna Attewell, Darlene Rife, Tammy Burgoyne, Tracy Mohr, Rachael Attewell and their spouses; Great Grandchildren, Austin, Michelie, Cameron, Alyssa, Siara, Krista, Nicholas, Jessica, Winston, Thomas, Isabel and 1 Great Great Grandson Talon. Three sisters, Phelma Schertel, Fern Thor, Wilma Odiorne and 1 brother Wilfred Ford (Shirley) as well as many nieces and nephews. She was predeceased by her husband Harold Attewell in 1988, sister Verna Herbert, brother-in-laws Johnny Jackson, George Schertel, Howard Thor, and Lester Odiorne. Edythe and Harold farmed at Ardrossan, Alberta for many years doing custom baling at a time when most area farmers did not own a baler. Mom was the one who baled most of the hay and straw around Brookville, Ardrossan, and Josephburg, Ab communities. Her children grew up in various hay fields with Mom holding us on her lap while she made the rounds or played in the shade of a vehicle on a blanket. Many a baby bottle were tossed off the tractor onto a swath that she had to climb down to retrieve. (John was especially proficient at this game). Mom retired to Armstrong, B.C. in February 1990 where she owned a suite opposite her sister Phelma. She did the bulk of the cooking but they ate in Phelma’s place, sharing and caring for each other. She became the “Queen of jam-making”, living in the North Okanagan region with full access to seasonal fruits. Any combination of fruit became an excellent tasting jam. Aging made the apartment stairs difficult to manage so she celebrated her 83rdbirthday by moving to Martensville, Saskatchewan to live with Dorothy and son-in-law Marvin, not realizing that dementia would begin to steal her mind. In February 2013, she entered a long-term care facility when 24 hour supervision became necessary. August of 2016, she was transferred to the Warman Mennonite Special Care Home where she resided until her passing. The care and attention she received from the staff at WMSCH was amazing and we are so thankful for their kindness and love. “Mom… until we meet again! We love you!! Her arrangements entrusted to Cherished Memories, Martensville. A private service will be held at a later date. 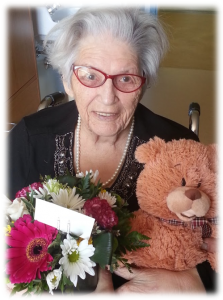 In lieu of flowers, donations to the Warman Mennonite Special Care Home would be appreciated.